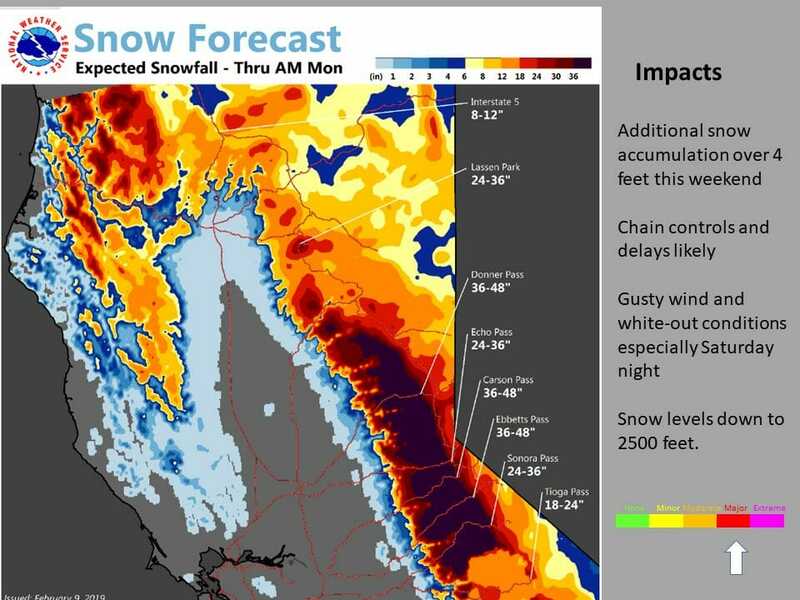 February 9, 2019 – Mountain and foothill snow is expected through the weekend. A chance of thunderstorms north valley today. 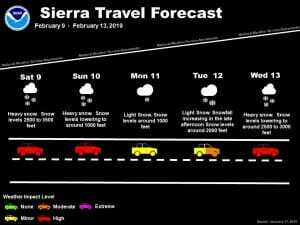 Heavy snow possible late Saturday through late Sunday. Gusty winds on Saturday night and Sunday. Wet, cool and unsettled pattern continues next week. Latest satellite imagery indicates a cold upper low diving southward along the West Coast, with the trough axis anticipated to move across the region on Sunday. Radar shows precipitation coverage and intensity increasing this afternoon across the area, with snow levels around 2,000 to 3,000 feet. Cloudy skies have been a limiting factor in terms of thunderstorm development this afternoon, but a few lightning strikes have been detected in Shasta County as a convergence zone has developed. 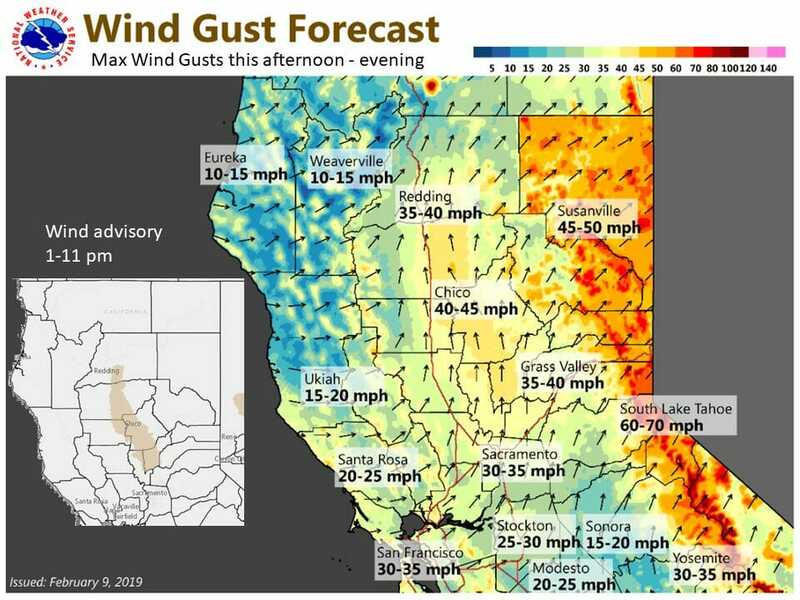 Tightening surface gradients (MFR-SAC gradient remains around 11-12 mbs) have resulted in southerly surface wind gusts from 25 to 45 mph in the Central Valley this afternoon. 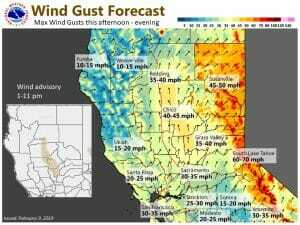 Models suggest the winds will continue through early this evening. Thus, a Wind Advisory remains in effect until 11 pm this evening for the northern and central Sacramento Valley. Latest high resolution models indicate a strong frontal boundary continuing to drop southward this afternoon, with the heaviest precipitation expected into the evening hours. Debris flow potential remains low as QPF amounts in the Valley are not expected to be particularly high; up to 0.50 inches of rain can be expected in the valley through late Sunday evening. Heavy snowfall will continue this afternoon into the evening hours, which combined with gusty winds will continue to bring periods of whiteout conditions. 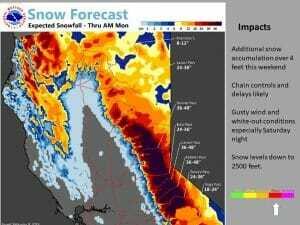 Additional snow accumulations through Sunday night could reach 2 to 4 feet. Models indicate the frontal boundary should be shifting south of the forecast area by Sunday morning. Cold air filtering in behind the frontal boundary will lower snow levels down to the valley floor over the northern Sacramento valley. Thus, a rain/snow mix could be possible, but QPF amounts should remain low so any snowfall in the Redding area should be fairly minimal. Showers will become lighter throughout Sunday afternoon in the valley, but activity will continue over the mountains. Flat ridging over the west coast next Monday will limit precipitation to the northern forecast area, and any light overrunning type rain or snow will remain mainly north of the interstate 80 corridor. Forecast models indicate a cold system dropping out of the north, that will approach the area on Tuesday and bring widespread precipitation across the region. 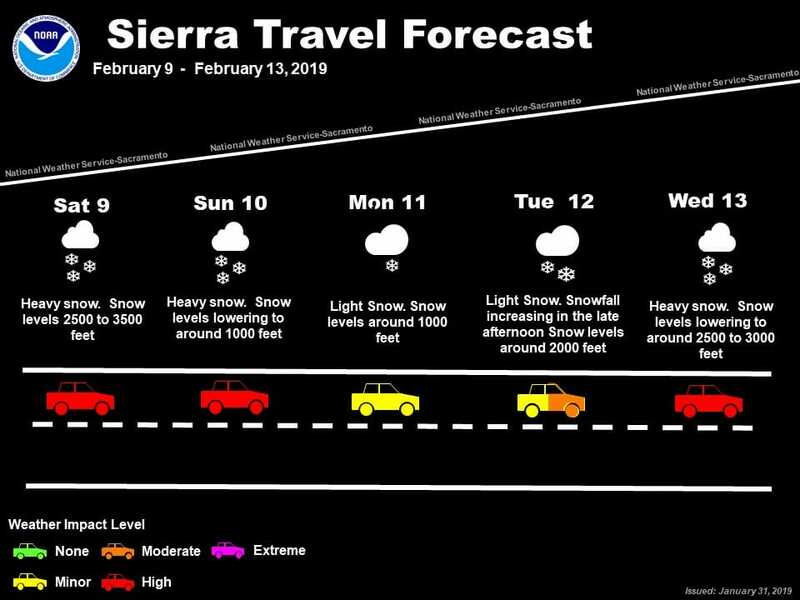 Expecting precipitation to gradually spread across interior NorCal by Tuesday afternoon into the evening hours, with the potential for significant mountain snow. The active, wet pattern will continue into next weekend, albeit with some intermittent breaks in between Pacific systems. A persistent blocking pattern across the central Pacific continues to favor trough passages into the western U.S. Beginning Wednesday, another positively-tilted trough will sweep through the region affording a round of precipitation until Thursday morning. Snow levels may not be quite as low as some of the recent storms, but the current forecast suggests 3,000 to 3,500 feet while dropping to 2,500 feet as the system exits. Some timing issues exist amongst the more reliable forecast models. Recent runs of the GFS continue to be a step ahead of the ECMWF, although the latter has shown a lot of inconsistencies the past few model cycles. Ultimately conditions should clear out by Thursday morning with a brief lull in the action ahead of yet another Pacific system looming offshore. The next Gulf of Alaska system arriving Friday will bring further chances for precipitation and additional snow to the Sierra, possibly into the upper foothills. This threat should continue into the early part of the weekend. While details will likely change in the upcoming days, there is reasonable confidence in this wet pattern given the favorable upstream blocking pattern.